Just after Japan entered the war, the SS President Coolidge was requisitioned by the United States Defence Department for wartime duties, primarily the transport of troops and equipment in the Pacific theatre of war. On 26 October 1942 the Coolidge was on a trip from "White Poppy" (Noumea, New Caledonia) to "Button" (Espirito Santo, Vanuatu) when she hit two US mines while entering Segond Channel on Santo. The master of the ship, Captain Henry Nelson, ran the Coolidge aground and evacuated the ship. 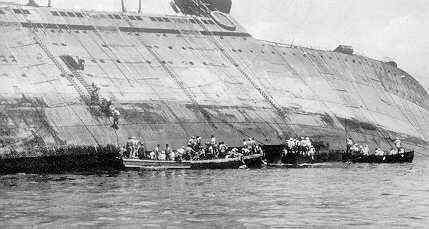 One hour and 14 minutes after hitting the mines, the Coolidge slipped off the shore into its final resting place. Two lives had been lost out of the 5340 persons on board. The dead were a fireman, Robert Reid, killed by the initial mine and an Army officer, Captain Elwood Euart. For information about the last trip of the SS President Coolidge, see the Last Trip and Sinking Page and for information about the SS President Coolidge itself see its page and for other Coolidge information, see the Main Coolidge Index. A Preliminary Court of Inquiry started on 12 November 1942 and went for five days. This was on the USS Whitney and was at the order of the Commander of the South Pacific Area and South Pacific Force, Admiral William "Bull" Halsey. A Military Commission at the College La Perouse at Noumea, New Caledonia. This was from 8 to 14 December 1942 and was to adjudicate on a charge laid against Henry Nelson by Admiral Halsey. However, before this happened, Captain Nelson wrote a letter to the Commanding Officer of Naval Forces at Santo, Captain Walter H. Roberts. This is reproduced in a separate page. It is not clear to me what occurred at this Court of Inquiry, but it apparently heard evidence about the sinking. It is possible that a report entitled "Survivors' Statements" about the sinking of the Coolidge was presented to the Inquiry. After five days of hearings, the Court decided that there should be further actions and charges laid against Captain Nelson. In Appendix Three of The Lady and the President - The Life and Loss of the S.S. President Coolidge, Peter Stone has attached some papers relating to the three hearings. One of the papers is headed Record of Procedure of a Court of Inquiry Convened on Board the U.S.S. Whitney, 12 November 1942 (page 243). This paper sets out some things which, on the basis of now known facts and assumptions, does not appear to be factual. In Lt Craig Hosmer's ( Log Book, he states that he appeared before this enquiry but states that it started on 17 November 1942 on the USS Whitney. He states that he was called again on 19 November 1942 but was not required to give evidence again. 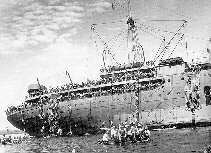 He was also interviewed on 14 November 1942 while on board MV Tabinta in Noumea. He makes no mention that he was a defence counsel. As as result of the above charge, Captain Nelson was ordered to appear before the Military Commission at Noumea on 8 December 1942. Captain Nelson was allocated Captain Gordon B. Parks, USN, and Lieutenant Chester Craig Hosmer, USNR as his defence counsels. However, Lt Hosmer makes no mention of this in his log book (see above). Anyway, they apparently prepared an "Objection to the Specifications" of the charge in an attempt to stop the Commission proceeding. This was on the basis that the charge against Captain Nelson was based on conclusions of fact rather than allegations. In addition, the objection was also made because the charges were also based on the fact that Captain Nelson was given a set of instructions that he ignored but that the charge did not specify what those instructions were. See Appendix Three of The Lady and the President - The Life and Loss of the S.S. President Coolidge by Peter Stone (page 246). This tactic did not succeed and the Commission started as planned. The Commission was made up of Rear Admiral Calvin H. Cobb, USN (President), Captain Schuyler Mills, USN, Captain George H. Bahm, USN, Commander Louis T. Young, USN and Commander Alexander F. Junker USN. The Judge Advocate (Prosecutor) was Captain Richard Fagan, US Marine Corps (Rtd). Captain Nelson was defended by Captain Gordon B. Parks, USN and Lieutenant Chester C. Hosmer, USNR. At the start of the Commission, Captain Nelson made a statement to the Commission. This is attached as a separate page. The Commission heard four days of evidence and then one (or possibly two) days of summary. Entry to be in daylight only It was then intended to prove that Captain Nelson ignored these instructions. 8 December 1942 Ensign John DeNovo who delivered the sailing instructions to Captain Nelson in Noumea testified. This includes the "special instructions". Other people gave evidence about the instructions. Ensign DeNovo also testified that when he handed the instructions to Captain Nelson, he pointed out the six documents contained in the envelope. 9 December 1942 Ensign DeNovo again testified, including the fact that when he handed over the envelope, the papers were held together with a paper clip. Of interest is that there was a list of some documents delivered and Captain Nelson was required to sign for them. The "Special Instructions" was one. The Third Officer of the Coolidge, Robert Lyons, gave evidence that Captain Nelson was in command of the ship as they approached Segond Channel. Lyons said he never saw any "Special Instructions" but he did see the other instructions. 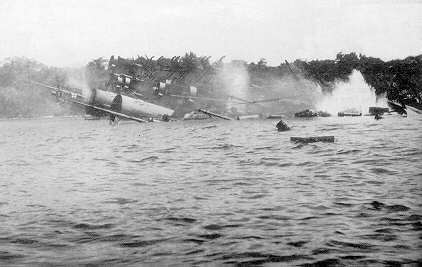 Lt John Davies, skipper, of the patrol boat PC479 stated that they saw the Coolidge for only 19 minutes but the Lyons states it was 45 minutes. Lt Davies says they attempted to talk to the larger vessel but no real conversation takes place. There was a lot of questioning of Lt Davies about why he did not intercept the Coolidge, radio her, show a pilot flag (PC479 had two pilots on board) when it must have been obvious that the ship was going to enter Segond Channel. There was no real answer. Ensign Doran Weinstein, communications officer on the Coolidge testified that no real signals were received till the warning message a few seconds before she hit the first mine. 10 December 1942 First Officer Kilton Davies testified that he had charted the voyage to "Hypo" and that when the Coolidge turned into Segond Channel, her speed was 18 to 19 knots. He said that Captain Nelson indicated that he intended to enter the eastern entrance to Segond Channel unless stopped or told to do otherwise. He said that the channel chosen was the only logical passage for a ship the size of the Coolidge. Chief Officer Milton McManus testified as to the cargo and personnel being carried and the loss of Fireman Robert Reid. The written report of Captain Nelson was tabled. Colonel Dinsmore Alter gave evidence about the loss of Captain Euart. Chief Quartmaster George Doyle (Noumea) stated that ships travelling to Santo were not advised that the Segond Channel was mined. Captain Nelson then testified. Amongst his evidence is that he did not receive the "Special Instructions" and that he did not receive any warnings from PC479 even though it had plenty of time to warn them. He was also questioned as to why he did not question the "General Instructions" which said in part "Thence to Button [Luganville town on Santo] noting attached instructions for entering Segond Channel" [my emphasis]. He gives no real evidence why he did not query, or at least proceed with utmost caution, when he found no "attached instructions", that is, no "Special Instructions". 11 December 1942 Ensign Weinstein again gave evidence. He stated that he did not received a message from PC479 that the Coolidge was entering a wrong entrance. Lt Davies from the patrol boat says he did not warn the Coolidge as he had no idea the ship would enter Segond Channel (!!!!). 12 December 1942 As the Record of the Proceedings of the Fourth Day were not ready, the commission was adjourned till Monday 14 December 1942. 14 December 1942 The proceedings of days four and five (not much as it was adjourned after only a few minutes) were read to the commission. The Judge Advocate and Captain Nelson read statements. There was no closing argument by the Judge Advocate. The trial finished and the President announced, apparently almost immediately, that the Commission had decided that Captain Nelson had no case to answer. What appears to me to be the closing statement of the Judge Advocate (referred to above on Sixth Day) at the Commission is reproduced in full in Appendix Three of The Lady and the President - The Life and Loss of the S.S. President Coolidge, Peter Stone (pages 252-255) but it is labelled the opening argument. I am not sure if this is correct. The written argument of Captain Nelson appears in Appendix Three of The Lady and the President - The Life and Loss of the S.S. President Coolidge, Peter Stone (pages 255-261). This appears to be the statement read on the Sixth Day after the evidence has been heard. In summary, Captain Nelson states that while he did receive instructions, they were not the alleged full set of instructions and that a vital piece of information, that being specific directions as to the method of approach to Segond Channel including details of which channel to use. It did not include information about any location of mines in the channels. This last bit was particularly noted as been relevant. Captain Nelson also made much that the obvious and safe entrance to Segond Channel was the one he chose and that there were no warnings given to him until it was far too late. Possibly after this, the defence made a closing statement, entitled Fatal Failure of Proof. I have attached this as a separate page. This is also in Appendix Three of The Lady and the President - The Life and Loss of the S.S. President Coolidge, Peter Stone (pages 261-2). After considering all the evidence produced, the Military Commission (consisting of Rear Admiral Calvin H. Cobb, USN (President), Captain Schuyler Mills, USN, Captain George H. Bahm, USN, Commander Louis T. Young, USN and Commander Alexander F. Junker USN) found Captain Henry Nelson not guilty. I do not have available to me the exact wording of the finding so I cannot report on any qualifications that the Commission may have made in giving the aquittal. The US Navy was not really happy with this finding and did not make much of an attempt to publicise this fact. The records of the Commission was not approved by the US Secretary of the Navy until 26 April 1943, more than five months after the accident and almost four months after the Commission. One matter that appears from this incident is that the skippers of US merchant ships operating during the war were not given all available information, especially about minefields. For example, a simple, straightforward advice to Captain Nelson that Segond Channel was mined and that entry should not be made except as contained in separate instructions would have avoided the loss of the Coolidge. As the Military Commission had already tried Captain Nelson and found him not guilty, the US Coast Guard Marine Investigation Board decided to take no further action.